Miranda Herman, a graduating senior from ASU’s School of Earth and Space Exploration (SESE) and the Department of Physics, will be receiving the Dean’s Medal and Moeur Award at commencement ceremonies this spring. 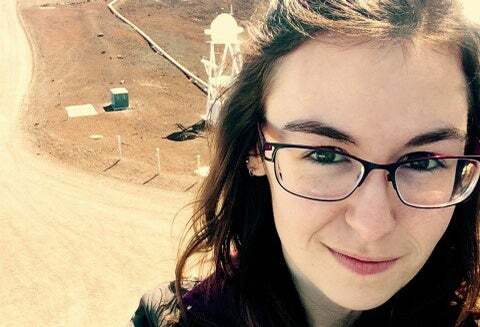 Originally from Saskatchewan, Canada, Miranda came to ASU to pursue her passion for astronomy, a passion that began in her high school physics class. Although the warm weather may have been a part of her decision to attend ASU, Herman was also delighted to be involved in research. While at ASU she worked on discovering stellar companions around exoplanet host stars, investigated the variability of brown dwarf atmospheres and worked for the European Southern Observatory in Chile, where she assisted in identifying protoplanetary disks around young stars in Taurus. During her undergraduate career she has been on the Dean’s List each semester; and in 2014 she was awarded the Ronald Greeley Planetary Geology scholarship for her work on exoplanet characterization. After graduation, Herman will return to Canada to pursue her PhD in astronomy and astrophysics at the University of Toronto. Herman answered some questions about her experience at ASU. Answer: I've always found anything space-related absolutely fascinating, but when I was younger I never really considered making a career out of it. Then in the 11th grade I convinced my physics teacher to spend a couple of weeks on the astrophysics chapter of our textbook, and after that I was hooked. I realized there was so much more to discover beyond our tiny planet, and I knew I wanted to be a part of that discovery. A: One thing I’ve learned while at ASU is that there’s an important balance between independence and reliance on others. You can only accomplish so much on your own, and the people around you are some of the most valuable resources you have. That realization has really impacted the way I approach problems both inside and outside of my academics. A: If I’m being honest, I chose ASU mostly for the weather! I got tired of cold Canadian winters, and Arizona was about as drastically different as I could get. ASU provided me with a beautiful setting in which to pursue my dreams, and it’s such a large and diverse school that I knew there would be countless opportunities for me here. A: Stay passionate about your work and never lose sight of your goals. Don’t get so caught up in the day-to-day bustle of classes and assignments and responsibilities that you forget why you wanted to be here in the first place. You’re capable of achieving anything you put your mind to, and your only true limitations are the ones you place upon yourself. A: My favorite place on campus is ISTB4. From the Curiosity Rover to the meteorite display to the Crater Carpet, I love everything about it! A: With $40 million I would set up a scholarship fund for students who want, and deserve, a college education, but simply don’t have access to it. Some students decide to move to a different country for better access to higher education, and speaking from experience, being an international student results in a lot of additional financial strain. I think we should encourage students to look beyond political borders and seek out educational opportunities wherever they might be, and scholarships would alleviate some of the stress associated with that.